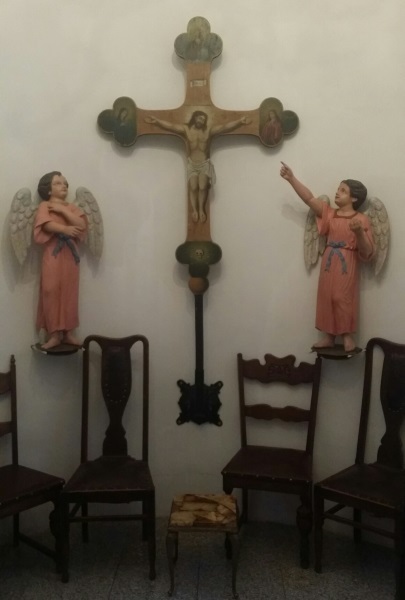 How could anyone throw this crucifix in the trash? Last evening, at a Church in Tykocin, Poland, an elderly priest showed me this cricifix, dated pre- World War I, which was recovered from a trash heap! This piece, from an art perspective, is exquisite, but from a spiritual perspective is even more important. You might ask "How could anyone throw this crucifix in the trash?" We cut a few corners because that is what the job requires, we are going to websites that are not good for us, we refrain from sticking up for our faith because we don't want to upset people. When we need to, we dust off the cross, display it prominently in our lives, and act like everything is fine. But when the cross of Christ becomes inconvenient again, back it goes into the trash heap of our lives. We can't play games with God. Christianity is not a religion of convenience. It is a radical, committed, way of life.....and in good times or in bad, whether convenient or inconvenient....we keep the cross......we keep the faith.